At one time a breed called the Oxford Sandy and Black was found in Oxford County, England. 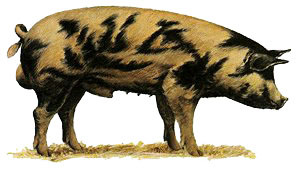 The Oxford Sandy & Black Pig sometimes referred to as the “Plum Pudding or Oxford Forest Pig” is one of the oldest British pig breeds, it has existed for 200-300 years. A traditional farmers and cottagers pig, of the middle part of the country, especially around Oxfordshire.It seems to be closely linked to the old Berkshire and Tamworth. Did it diverge from them? Or was it the result of crossbreeding between them? Or crossbreeding with an entirely different breed no-one is entirely sure. The Oxford Sandy & Black or OSB has reached crisis point at least twice in it’s past when numbers dropped so low that extinction was a real possibility. Unfortunately it had no Society or herd book to look after it’s wellbeing. As long ago as the 1940’s boar licensing had dropped to one or two a year for OSB’s but for a few dedicated breeders the breed would surely have been lost. In 1973 the Rare Breeds Survival Trust was formed giving hope for the breed, but the Trust decided not to recognise the OSB. Once again the dedicated breeders were on their own. The decline continued to the brink of extinction when in 1985 the current Breed Society was formed following contact with all known breeders of the OSB by the Societies founder secretary Steven Kimmins ably supported and helped by Andrew J.Sheppy Chairman and Geoffrey Cloke President. The breed owes a great debt and it’s survival to them. The breed has many good qualities, particularly it’s excellent temperament and mothering abilities. Prolific and hardy it is particularly suited to outdoor systems, being good foragers and as they are a coloured pig with a good coat they are far less prone to sunburn. The base colour should be a light sandy to rust with random black blotches (not spots) with a white blaze, feet and tassel. A medium to large pig with good length and a deep body, good quarters and fine shoulders, strong legs and feet and well set on, giving a free and active gait. A moderately strong head, straight or slightly dished with lop or semi lop ears. The Oxford Sandy and Black. British Pig Association. 8 Feb. 2007 <http://www.britishpigs.org.uk/breed_os.htm>.